Dr Michael Schwarzkopf speaking at the Reutte press conference. The Plansee Group reports that in the 2015/16 fiscal year it achieved consolidated sales of €1.18 billion. 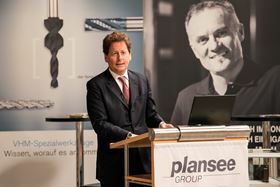 ‘Despite a dramatic fall of up to 42% in raw materials prices, we were generally able to maintain sales volumes and sales at a stable level,’ said Plansee Group chairman of the executive board, Dr Michael Schwarzkopf at a press conference held in Reutte, Austria. At the global level, more than half of the Plansee Group's sales come from the mechanical engineering, automotive and consumer electronics sectors. Broken down into the group's three main sales regions, 53% of sales were achieved in Europe, 23% in America and 24% in Asia. Demand in Europe was relatively strong and was driven by exporters such as the mechanical engineering and automotive industries. The aviation industry remained robust throughout the year. Even though China was unable to achieve its growth rates of the preceding years, the Plansee Group continued to increase its sales in the country and in Southeast Asia. The market environment in North America proved to be more difficult, primarily due to the continued weakness of the oil, gas and mining industries, the company said. Sufficient production capacity to meet global molybdenum demand enabled a very positive development of molybdenum ore processor Molymet in Chile. Across the group, €60 million, the equivalent of 5% of sales, was invested in innovation projects. With equity capital of more than €1.1 billion and no net debt, the Plansee Group is ready for further expansion projects, it said. ‘We are not just exceptionally well prepared for times of sluggish growth but are ready to make large-scale acquisitions anytime,’ said Schwarzkopf. This story is reprinted from material from Plansee, with editorial changes made by Materials Today. The views expressed in this article do not necessarily represent those of Elsevier. The Plansee Group says that it achieved 2017/18 fiscal year consolidated sales of €1.3 billion, an 11% increase year on year. Toray reports that its consolidated net sales for the fiscal year ended 31 March 2016 increased 4.7% compared with the previous fiscal year.